For most businesses, machine learning seems close to rocket science, appearing expensive and talent demanding. And, if you’re aiming at building another Netflix recommendation system, it really is. But the trend of making everything-as-a-service has affected this sophisticated sphere, too. You can jump-start an ML initiative without much investment, which would be the right move if you are new to data science and just want to grab the low hanging fruit. One of ML’s most inspiring stories is the one about a Japanese farmer who decided to sort cucumbers automatically to help his parents with this painstaking operation. Unlike the stories that abound about large enterprises, the guy had neither expertise in machine learning, nor a big budget. But he did manage to get familiar with TensorFlow and employed deep learning to recognize different classes of cucumbers. By using machine learning cloud services, you can start building your first working models, yielding valuable insights from predictions with a relatively small team. We’ve already discussed machine learning strategy. Now let’s have a look at the best machine learning platforms on the market and consider some of the infrastructural decisions to be made. Machine learning as a service (MLaaS) is an umbrella definition of various cloud-based platforms that cover most infrastructure issues such as data pre-processing, model training, and model evaluation, with further prediction. Prediction results can be bridged with your internal IT infrastructure through REST APIs. 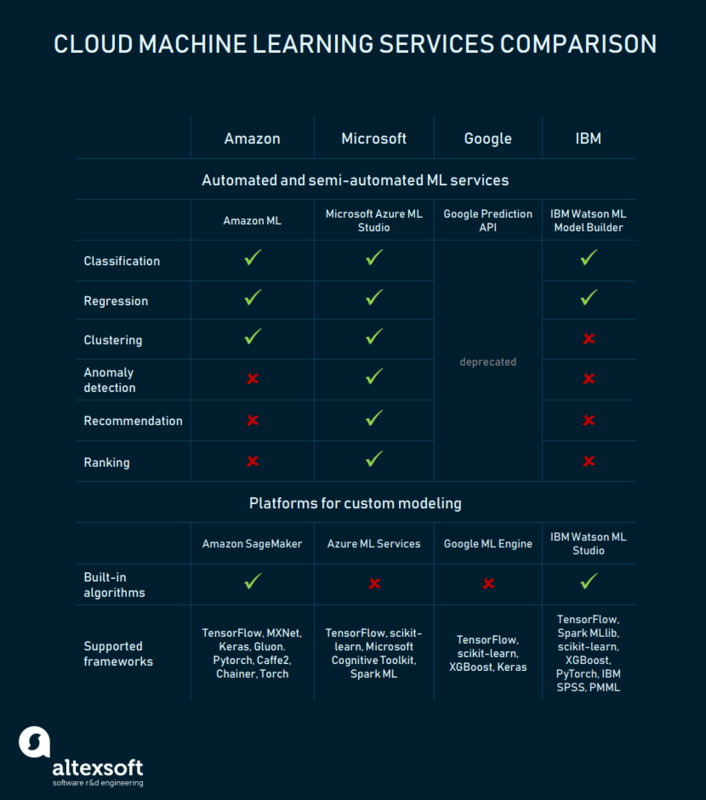 Amazon Machine Learning services, Azure Machine Learning, Google Cloud AI, and IBM Watson are four leading cloud MLaaS services that allow for fast model training and deployment. These should be considered first if you assemble a homegrown data science team out of available software engineers. Have a look at our data science team structures story to have a better idea of roles distribution. 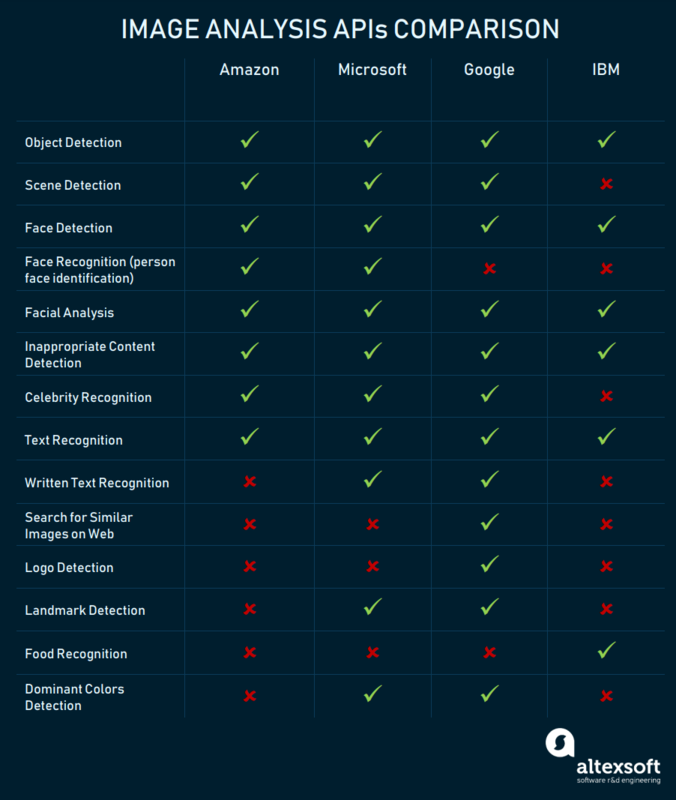 Within this article, we’ll first give an overview of the main machine-learning-as-a-service platforms by Amazon, Google, Microsoft, and IBM, and will follow it by comparing machine learning APIs that these vendors support. Please note that this overview isn’t intended to provide exhaustive instructions on when and how to use these platforms, but rather what to look for before you start reading through their documentation. Amazon Machine Learning services are available on two levels: predictive analytics with Amazon ML and the SageMaker tool for data scientists. Amazon Machine Learning for predictive analytics is one of the most automated solutions on the market and the best fit for deadline-sensitive operations. The service can load data from multiple sources, including Amazon RDS, Amazon Redshift, CSV files, etc. All data preprocessing operations are performed automatically: The service identifies which fields are categorical and which are numerical, and it doesn’t ask a user to choose the methods of further data preprocessing (dimensionality reduction and whitening). Prediction capacities of Amazon ML are limited to three options: binary classification, multiclass classification, and regression. That said, this Amazon ML service doesn’t support any unsupervised learning methods, and a user must select a target variable to label it in a training set. Also, a user isn’t required to know any machine learning methods because Amazon chooses them automatically after looking at the provided data. This high automation level acts both as an advantage and disadvantage for Amazon ML use. If you need a fully automated yet limited solution, the service can match your expectations. If not, there’s SageMaker. Built-in SageMaker methods largely intersect with the ML APIs that Amazon suggests, but here it allows data scientists to play with them and use their own datasets. If you don’t want to use these, you can add your own methods and run models via SageMaker leveraging its deployment features. Or you can integrate SageMaker with TensorFlow, Keras, Gluon, Caffe2, Torch, MXNet, and other machine learning libraries. Generally, Amazon machine learning services provide enough freedom for both experienced data scientists and those who just need things done without digging deeper into dataset preparations and modeling. This would be a solid choice for companies that already use Amazon cloud services and don’t plan to transition to another cloud provider. Azure Machine Learning platform is aimed at setting a powerful playground both for newcomers and experienced data scientists. The roster of Microsoft machine learning products is similar to the ones from Amazon, but Azure, as of today, seems more flexible in terms of out-of-the-box algorithms. Services from Azure can be divided into two main categories: Azure Machine Learning Studio and Bot Service. Let’s find out what’s under the hood of Azure ML Studio. We’ll return to Bot Service in the section dedicated to specific APIs and tools. ML Studio is the main MLaaS package to look at. Almost all operations in Azure ML Studio must be completed using a graphical drag-and-drop interface. This includes data exploration, preprocessing, choosing methods, and validating modeling results. Approaching machine learning with Azure entails some learning curve. But it eventually leads to a deeper understanding of all major techniques in the field. The Azure ML graphical interface visualizes each step within the workflow and supports newcomers. Perhaps the main benefit of using Azure is the variety of algorithms available to play with. The Studio supports around 100 methods that address classification (binary+multiclass), anomaly detection, regression, recommendation, and text analysis. It’s worth mentioning that the platform has one clustering algorithm (K-means). Another big part of Azure ML is Cortana Intelligence Gallery. It’s a collection of machine learning solutions provided by the community to be explored and reused by data scientists. The Azure product is a powerful tool for starting with machine learning and introducing its capabilities to new employees. “Azure ML Services is our next generation infrastructure for building and deploying models at scale, using any tool or framework. Azure ML Services provides end-to-end lifecycle management, keeping track of all of your experiments across your entire team, storing code, config, parameter settings, and environment details to make it easy to rank, search, and replicate any experiment done by your team. Once you have a model you like, you can easily encapsulate it in a container and deploy to Azure, on-prem, or IOT devices, and it’s easy to scale and manage as it is “just another container” that runs on Kubernetes. Azure ML Services makes it easy to start locally, in a Python editor or notebook of your choice, and then easily compute in Azure and scale up/out when you need it.” says Matt. Basically, the services suggest a support environment to build models, experiment with them, and use a broad variety of open source components and frameworks. Unlike ML Studio, it doesn’t have built-in methods and requires custom model engineering. 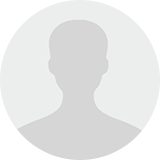 The platform is aimed at rather experienced data scientists to operate it. And if you have the right team, ML Services offers a powerful toolset to manage ML experiments, use popular frameworks like TensorFlow, scikit-learn, etc. (which isn’t available with ML Studio), and deploy models into production in a third-party service like Docker. Let’s have a closer look at what the ML Services platform suggests. Python packages. These proprietary packages have libraries and functions that aim at four main groups of tasks: computer vision, forecasting, text analysis, and hardware acceleration. Experimentation. With any Python tools and frameworks, engineers can build different models, compare them, set the project to specific historic configuration, and continue development from any moment in history. Model management. The tool provides an environment to host, version, manage, and monitor models that run on Azure, on-premises, or even Edge devices. Workbench. This product is a convenient desktop and command-line environment with dashboards and evaluation tools to track model development. Visual Studio Tools for AI. Basically, this extension adds tools to the VS IDE to work with deep learning and other AI products. Google provides AI services on two levels: a machine learning engine for savvy data scientists and highly automated Google Prediction API. Unfortunately, Google Prediction API has been deprecated recently and Google has pulled the plug on April 30, 2018. The Predicion API resembled Amazon ML. Its minimalistic approach narrowed down to solving two main issues: classification (both binary and multiclass) and regression. Trained models could be deployed through the REST API interface. Google doesn’t disclose exactly which algorithms were utilized for drawing predictions and didn’t allow engineers to customize models. On the other hand, Google’s environment was the best fit for running machine learning within tight deadlines and the early launch of the ML initiative. But it seems that the product wasn’t nearly as popular as Google expected. It’s a shame that those who were using Prediction API will have to “recreate existing models” using other platforms as the end-of-life FAQ suggests. Google is testing Cloud AutoML. The product is currently in alpha, so it doesn’t even have documentation yet. The early pieces of information claim that AutoML will allow people without data science expertise to train models on their data in an automated manner. The first product to be launched will be AutoML vision capable of building custom image recognition models. In the longer run, Google expects to cover even more areas. High automation of Prediction API was available at the cost of flexibility. Google ML Engine is the direct opposite. It caters to experienced data scientists, it’s very flexible, and it suggests using cloud infrastructure with TensorFlow as a machine learning driver. Additionally, Google is testing a number of other popular frameworks like XGBoost, scikit-leran, and Keras. So, ML Engine is pretty similar to SageMaker in principle. TensorFlow is another Google product, which is an open source machine learning library of various data science tools rather than ML-as-a-service. It doesn’t have visual interface and the learning curve for TensorFlow would be quite steep. However, the library is also targeted at software engineers that plan transitioning to data science. Google TensorFlow is quite powerful, but aimed mostly at deep neural network tasks. Basically, the combination of TensorFlow and Google Cloud service suggests infrastructure-as-a-service and platform-as-a-service solutions according to the three-tier model of cloud services. We talked about this concept in our whitepaper on digital transformation. Have a look, if you aren’t familiar with it. IBM suggests a single machine learning platform both for experienced data scientists and newcomers in the sphere. Technically, the system offers two approaches: automated and manual – for expert practitioners. Similar to a deprecated Google Prediction API or still operational Amazon ML, Watson Studio has a model builder which brings to mind a fully automated data processing and model building interface that needs little to no training to start processing data, preparing models, and deploying them into production. Separately, IBM offers deep neural network training workflow with flow editor interface similar to the one used in Azure ML Studio. If you’re looking for advanced capabilities, IBM ML has notebooks such as Jupiter to program models manually using popular frameworks like TensorFlow, scikit-learn, PyTorch, and others. To wrap up with machine learning as a service (MLaaS) platforms, it seems that Azure has currently the most versatile toolset on the MLaaS market. It covers the majority of ML-related tasks, provides two distinct products for building custom models, and has a solid set of APIs for those who don’t want to attack data science with their bare hands. Amazon provides multiple APIs that aim at popular tasks within text analysis. These are also highly automated in terms of machine learning and just need proper integration to work. Amazon Lex. The Lex API is created to embed chatbots in your applications as it contains automatic speech recognition (ASR) and natural language processing (NLP) capacities. These are based on deep learning models. The API can recognize written and spoken text and the Lex interface allows you to hook the recognized inputs to various back-end solutions. Obviously, Amazon encourages use of its Lambda cloud environment. So, prior to subscribing to Lex, get acquainted with Lambda as well. Besides standalone apps, Lex currently supports deploying chatbots for Facebook Messenger, Slack, and Twilio. Amazon Transcribe. While Lex is a complex chatbot-oriented tool, Transcribe is created solely for recognizing spoken text. The tool can recognize multiple speakers and works with low-quality telephony audio. This makes the API a go-to solution for cataloging audio archives or a good support for the further text analysis of call-center data. Amazon Polly. The Polly service is kind of a reverse of Lex. It turns text into speech, which will allow your chatbots to respond with voice. It’s not going to compose the text though, just make the text sound close to human. If you’ve ever tried Alexa, you’ve got the idea. Currently, it supports both female and male voices for 25 languages, mostly English and Western European ones. Some languages have multiple female and male voices, so there’s even a variety to choose from. Like Lex, Polly is recommended for use with Lambda. This service will help you analyze social media responses, comments, and other big textual data that’s not amenable to manual analysis, e.g. the combo of Comprehend and Transcribe will help analyze sentiment in your telephony-driven customer service. Amazon Translate. As the name states, the Translate service translates texts. Amazon claims that it uses neural networks which – compared to rule-based translation approaches – provides better translation quality. Unfortunately, the current version supports translation from only six languages into English and from English into those six. The languages are Arabic, Chinese, French, German, Portuguese, and Spanish. Just like Amazon, Microsoft suggests high-level APIs, Cognitive Services, that can be integrated with your infrastructure and perform tasks with no data science expertise needed. While this set of APIs mainly intersects with what Amazon and Microsoft Azure suggest, it has some interesting and unique things to look at. Dialogflow. With various chatbots topping today’s trends, Google also has something to offer. Dialogflow is powered by NLP technologies and aims at defining intents in the text, and interpreting what a person wants. The API can be tweaked and customized for needed intents using Java, Node.js, and Python. Cloud natural language API. This one is almost identical in its core features to Comprehend by Amazon and Language by Microsoft. Cloud translation API. Basically, you can use this API to employ Google Translate in your products. This one includes over a hundred languages and automatic language detection. IBM also competes for the API market. Let’s have a look at their set of interfaces. Speech to Text. Currently, IBM offers speech recognition for 9 languages, including Japanese, Portuguese, and Arabic. The API can recognize multiple speakers, spot keywords, and handle lossy audio. An interesting feature is capturing word alternatives and reporting them. For instance, if the system spots the word “Boston,” it can assume that there may be an “Austin” alternative. Upon analyzing its hypothesis, the API assigns a confidence score to each alternative. Text to Speech. 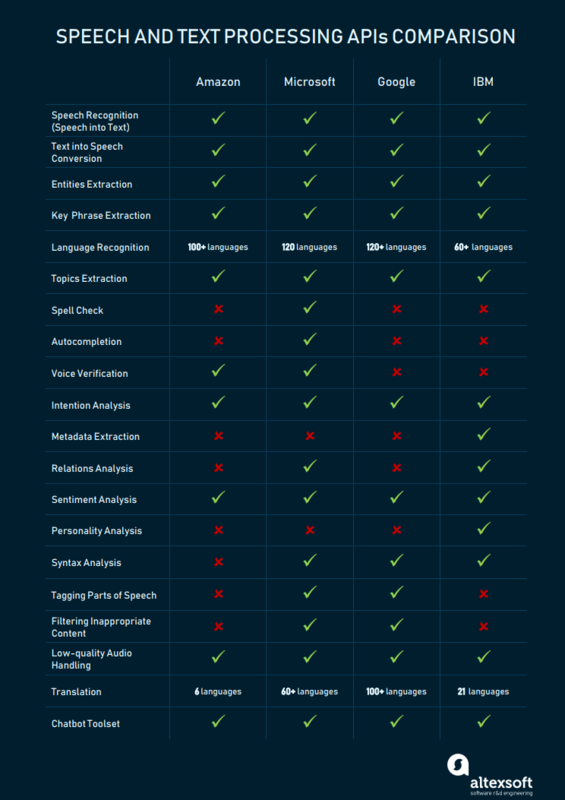 Interestingly, 9 text to speech languages only partly match those in the speech to text API. While both products support Western European languages, Text to speech lacks Korean and Chinese. English, German, and Spanish allow you to choose between male and female voices; the rest of the languages come with female voices only. This is in line with the trend toward making voice assistants sound mostly female. Language translator. The API supports 21 languages for translation from and to English. Additionally, you can add custom models and expand the language coverage. Natural language classifier. Unlike most of the APIs mentioned, the classifier by IBM can’t be used without your own dataset. Basically, the tool allows you to train models using your own business data and then classify incoming records. Common use cases are tagging products in eCommerce, fraud detection, categorizing messages, social media feeds, etc. Natural language understanding. The language understanding feature set at IBM is extensive. Besides standard information extraction like keyword and entity extraction with syntax analysis, the API suggests a number of interesting capabilities that aren’t available from other providers. These include metadata analysis and finding relations between entities. Additionally, IBM suggests a separate environment to train your own models for text analysis using Knowledge Studio. values (e.g. helping others, achieving success, hedonism). Based on this data, the API can infer consumption preferences (e.g. music, learning, movies). The most common use case for such a system is user-generated content analysis for precise product marketing. Tone analyzer. Tone analyzer is a separate API that focuses on sentiment analysis and is aimed at social media research and various customer engagement analytics. Don’t be confused by its somewhat ambiguous name. The analyzer covers only written text and doesn’t extract insights from spoken ones. Besides text and speech, Amazon, Microsoft, Google, and IBM provide rather versatile APIs for image and video analysis. While image analysis closely intersects with video APIs, many tools for video analysis are still in development or beta versions. For instance, Google suggests rich support for various image processing tasks but definitely lacks video analysis features already available at Microsoft and Amazon. The Vision package from Microsoft combines six APIs that focus on different types of image, video, and text analysis. While on the feature-list level Google AI services may be lacking some abilities, the power of Google APIs is in the vast datasets that Google has access to. Here, we’ll discuss specific API offerings and tools that come from Microsoft and Google. 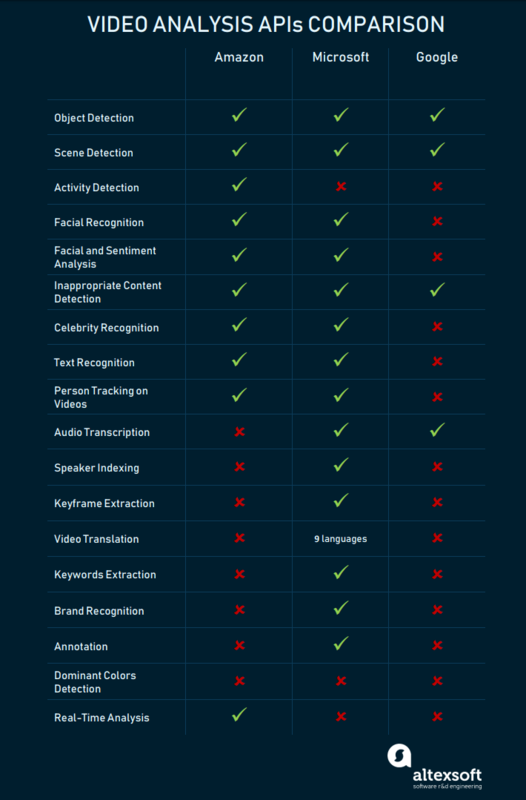 We didn’t include Amazon here, as their sets of APIs merely match the above-mentioned categories of text analysis and image+video analysis. However, some of the capacities of these specific APIs are also present in Amazon products. Azure Service Bot framework. Microsoft has put a lot of effort into providing its users with flexible bot development toolset. Basically, the service contains a full-blown environment for building, testing, and deploying bots using different programming languages. Interestingly, the Bot Service doesn’t necessarily require machine learning approaches. As Microsoft provides five templates for bots (basic, form, language understanding, proactive, and Q&A), only the language understanding type requires advanced AI techniques. Bing Search from Microsoft. Microsoft suggests seven APIs that connect with the core Bing search features, including autosuggest, news, image, and video search. Google Cloud Job Discovery. The API is still in the early development, but soon it may redefine the job search capacities that we have today. Unlike conventional job search engines that rely on precise keyword matches, Google employs machine learning to find relevant connections between highly variative job descriptions and avoid ambiguity. For instance, it strives to reduce irrelevant or too broad returns, like returning all jobs with the keyword “assistant” for the query “sales assistant.” What are the main features of the API? Watson Assistant. The Watson chatbot platform (formerly Conversation) is rather famous among AI engineers that specialize in conversational interfaces. IBM provides a full-fledged infrastructure for building and deploying bots capable of live conversation leveraging entity and user intent analysis in messages. Engineers can either use built-in support from Facebook Messenger and Slack deployment or create a client application to run the bot there. All four platforms described before provide fairly exhaustive documentation to jump-start machine learning experiments and deploy trained models in a corporate infrastructure. There are also a number of other ML-as-a-Service solutions that come from startups, and are respected by data scientists, like PredicSis and BigML. Finding the right storage for collecting data and further processing it with machine learning is no longer a great challenge, assuming that your data scientists have enough knowledge to operate popular storage solutions. In most cases, machine learning requires both SQL and NoSQL database schemes, which are supported by many established and trusted solutions like Hadoop Distributed File System (HDFS), Cassandra, Amazon S3, and Redshift. For organizations that have used powerful storage systems before embarking on machine learning, this won’t be a barrier. If you plan to work with some ML-as-a-service system, the most straightforward way is to choose the same provider both for storage and machine learning as this will reduce time spent on configuring a data source. However, some of these platforms can be easily integrated with other storages. Azure ML, for instance, mainly integrates with other Microsoft products (Azure SQL, Azure Table, Azure Blob) but also supports Hadoop and a handful of other data source options. These include direct data upload from a desktop or on-premise server. The challenges may arise if your machine learning workflow is diversified and data comes from multiple sources. Accelerate hardware. If you do relatively simple tasks and don’t apply your models for big data, use solid-state drives (SSDs) for such tasks as data preparation or using analytics software. Computationally intensive operations can be addressed with one or several graphical processing units (GPUs). A number of libraries are available to let GPUs process models written even with such high-level languages as Python. Consider distributed computing. Distributed computing implies having multiple machines with tasks split across them. However, this approach isn’t going to work for all machine learning techniques. Use cloud computing for scalability. If your models process customer-related data that has intensive peak-moments, cloud computing services will allow for rapid scalability. For the companies that are required to have their data on-premise only, it’s worth considering private cloud infrastructure. It’s easy to get lost in the variety of solutions available. They differ in terms of algorithms, they differ in terms of required skillsets, and eventually they differ in tasks. This situation is quite common for this young market as even the four leading solutions that we’ve talked about aren’t fully competitive with each other. And more than that, the velocity of change is impressive. There’s a high likelihood that you’ll stick with one vendor and suddenly another one will roll out something unexpectedly that matches your business needs. The right move is to articulate what you plan to achieve with machine learning as early as possible. It’s not easy. Creating a bridge between data science and business value is tricky if you lack either data science or domain expertise. We at AltexSoft encounter this problem often when discussing machine learning applications with our clients. It’s usually a matter of simplifying the general problem to a single attribute. Whether it’s the price forecast or another numeric value, the class of an object or segregation of objects into multiple groups, once you find this attribute, deciding the vendor and choosing what’s proposed will be simpler. Bradford Cross, founding partner at DCVC, argues that ML-as-a-services isn’t a viable business model. According to him, it falls in the gap between data scientists who are going to use open source products and executives who are going to buy tools solving tasks at the higher levels. However, it seems that the industry is currently overcoming its teething problems and eventually we’ll see far more companies turning to ML-as-a-service to avoid expensive talent acquisitions and still possess versatile data tools. I have tried a few Cloud ML solutions but settled on Microsoft Azure Machine Learning because it’s so easy. I’m surprised to see it reviewed. Regarding frameworks, I believe one should mention RevoScaleR for Microsoft. It allows easy ML on Big data. Thanks for a suggestion, Jérôme! We’ll look into it the next time we update the article. Interesting with new updates. Will surely give try to AWS. thank you for sharing this comparison between different services. Hi, DeeJay. What we meant is that Google has Prediction Gallery with language identifier, tag categorizer, and sentiment predictor. Interesting comparison! I’ve tried a few Cloud ML solutions but settled on Microsoft Azure Machine Learning because it’s so easy. I’m surprised to seeing it reviewed as a “steep learning curve” – my experience was exactly the opposite. I guess I need to go back and give the others a try! Thanks for a comment, Andrew! Comparing to the Amazon and Google systems, where everything is pretty much automated, Azure is really more difficult, however, it’s great to hear that you’ve managed it with ease! Nicely crafted article Thank you! Thanks! We’re glad you found it useful.